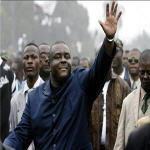 About 1,000 people have marched in the Democratic Republic of Congo's capital, Kinshasa, to protest the arrest of former rebel leader Jean-Pierre Bemba on war crimes charges. The demonstrators Tuesday blew whistles, carried posters and chanted "Free Bemba." Bemba was arrested in Belgium on Saturday for war crimes he allegedly committed in the Central African Republic. The International Criminal Court says his forces carried out a series of rapes and murders in the CAR between October 2002 and March 2003. Members of Bemba's Movement for the Liberation of Congo, MLC, group insist he is innocent. An MLC official, Mika Pere Perry, says former CAR President Ange-Felix Patasse should be arrested instead. Patasse had invited Bemba's group into his country to help put down a coup attempt. Bemba is facing four counts of war crimes and two counts of crimes against humanity. His arrest is the first stemming from an investigation opened by ICC chief prosecutor Luis Moreno-Ocampo a year ago. Belgian officials must approve his transfer to the ICC before he can go on trial. After Congo's civil war, Bemba's MLC group became a political party. At one time Bemba was Congo's vice president. He lost the 2006 DRC presidential election to President Joseph Kabila. Bemba left Congo for Portugal in April of 2007 after clashes between his supporters and government forces killed more than 200 people.